Superchips ECU remap transforms the VW Transporter 2.0 TDi (84PS), adding 76bhp! Superchips Ltd, the world leader in ECU remapping has well documented track record of improving the performance of Volkwagen products, but even they sometimes surprise themselves at the amazing power gains that can be safely and reliably achieved with their expertise. Superchips ECU remap for VW 2.0 BiTDI (180PS) California, Caravelle and Transporter now available! Superchips Ltd, the sole official tuning parter of Volkswagen Racing UK, is pleased to announce a brand new high performance ECU remap (or ‘chip’) for the 180PS (178bhp) 2.0 BiTDI powerplant used in the VW Transporter, plus the California and Caravelle models. 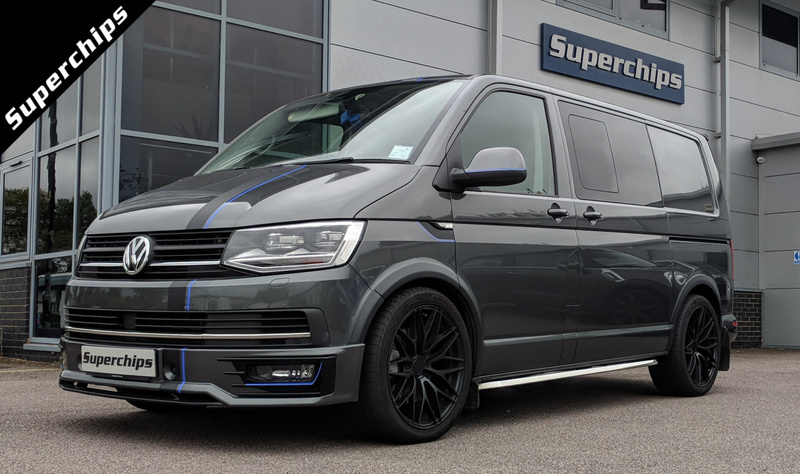 Superchips has put its extensive Volkswagen ECU remapping experience to good use and has managed to increase the performance of the 180PS (178bhp) 2.0 BiTDI VW Transporter, California and Caravelle by an excellent 31bhp at just 2843rpm. 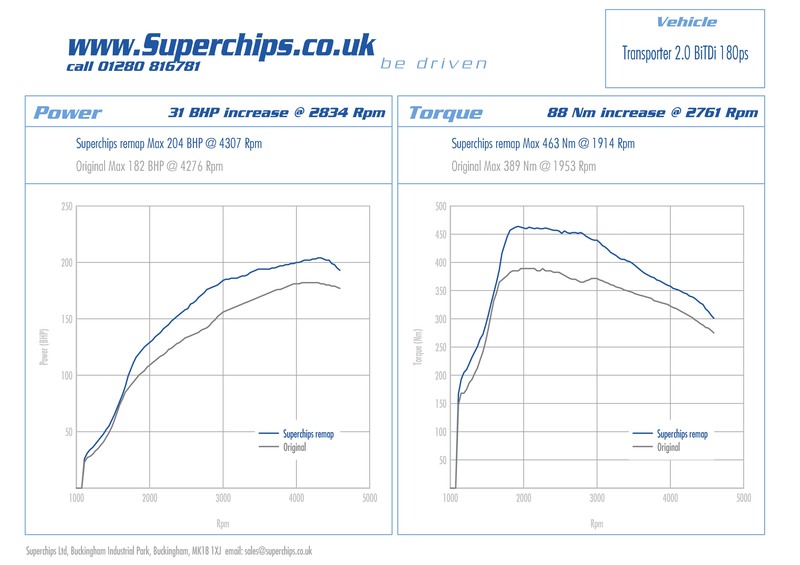 The Superchips ECU remap also boosts torque output on the 180PS (178bhp) 2.0 BiTDI VW Transporter, California and Caravelle by a considerable 88Nm at 2761 rpm. From behind the wheel the Superchips remapped 180PS (178bhp) 2.0 BiTDI VW Transporter, California and Caravelle feels sharper, more eager and pulls harder from low engine speeds. Overtaking, towing and low speed flexibility are greatly improved and customers can be reassured that if a Superchips ECU remapped 180PS (178bhp) 2.0 BiTDI VW Transporter, California and Caravelle is driven in a like-for-like manner with a standard car, fuel economy will not be adversely affected. In some instances fuel economy can improve by up to 7%, as proven by independent tests on Superchips remapped cars. Superchips is pleased to announce the release of a high performance ECU remap for the Volkswagen Transporter 2.0 TDI 140PS CR model. Superchips achieves an excellent maximum power gain of 32 bhp at 3550 rpm and torque of 101 Nm at 1960 rpm, see powercurve below.